Let’s say its 3 a.m. and you’re awoken by the sound of screeching tires and lights flickering through your window. A few emergency service vehicles just pulled up at the end of your street and you’re now wide awake and curious as to what’s happening down there. Your options include going outside, calling a neighbor (or, at least, an understanding neighbor), or… hey wait a second, there’s an app for that. 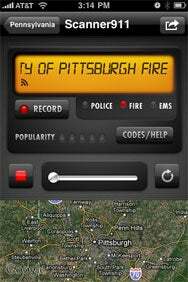 Actually there are several radio-scanner apps, and I took a look at two of them—Police Scanner 2 from Juicy Development and Scanner 911 from Matthew Pease. When shopping around for these kinds of scanner apps, you’ll find a popular cocktail of features common to many App Store offerings. That’s certainly the case here—both Scanner 911 and Police Scanner 2 enable you to browse by different areas, set favorite streams you can return to at any time, and find local streams using GPS. Both apps also do their best to indicate what services the stream is broadcasting (EMS, police, or fire) and allow you to record streams. Both also make use of the iPhone’s ability to play a QuickTime stream in the background via Safari. So how do you differentiate between scanner apps? In this case, the factors that set these two particular apps apart are their ability to successfully deliver a stream and what sort of bells and whistles they’ve included. Where’s the Action: Scanner911 features optional map integration which shows you the coverage area of the emergency field you’re streaming. When it comes to doing exactly what’s promised, Scanner 911 comes out on top. It launches smoothly and quickly to bring you to a menu offering the directory of feeds, a listing of popular feeds, recording capabilities, and all the other sorts of things you would want from this kind of app. Beyond the basics, attention to detail shines through in the Scanner 911 interface, simply by offering police emergency codes within the a given stream and showing popularity of each feed in the directory. The user can also customize Scanner 911’s skin for visual appeal or increased readability. My favorite feature, though, is Scanner 911’s optional map integration. By turning on this feature in the settings, when you open a stream, your iPhone screen is bisected with a map on the bottom showing the coverage area of that feed. It might seem inconsequential, but when listening to buzz on the radio, it’s nice to be able to reference a map to see where the alerts are happening. Unfortunately, Police Scanner 2 made less of a positive impression. The app takes a while to load, crashes frequently, and can sometimes take multiple attempts to launch. More significantly, it seems to have a problem handling the basics you’d expect from a scanner app; I ran into several errors within the app just trying to connect to a stream. Occasionally Police Scanner 2 will appear to be doing absolutely nothing after selecting a stream or will perpetually try to connect. Listen In: Police Scanner 2 lets browse for emergency radio streams by location. You can designate favorites and even let other users know when something interesting is going on. 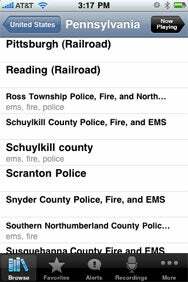 Still, if you get past those problems, Police Scanner’s developer has made an effort to set its app apart through a handful of cool features. The user can share any stream from Police Scanner 2 with a friend via Facebook or Twitter, for example. But probably the app’s best feature is its attempt to turn listening to feeds into a community-driven experience. While listening to a stream, you can let others know if something interesting is afoot with a Submit an Alert feature that pops up under the listing for that state while others are browsing. In theory, a Police Scanner 2 users would be able to watch text alerts stream in for a given area without having to connect to the feed. Listening to radio scanners via the iPhone is mostly a hobbyist activity these days. As such, the app that’s easiest to use and offers the best set of features figures to lead the rest of the pack. Looking at these two apps in that light, it’s plain to see that Scanner 911 does a fine job of delivering on its promise of streaming emergency radio feeds with a bit of frosting on top in features and a friendly interface; Police Scanner 2 has trouble with the basics. If you’re looking to sit back and find out what’s going on at the end of the street or even on the other side of the planet, Scanner 911 won’t leave you disappointed.